Mammography continues to be the standard of care for breast cancer screening. However, not only can dense breast tissue mask breast cancer on mammography, breast density is an independent risk factor for developing breast cancer. This multidisciplinary discussion between Dr. Emily Conant, Division Chief of Breast Imaging, and Dr. DaCarla Albright, Associate Professor of Clinical Obstetrics & Gynecology at the University of Pennsylvania addresses the importance of counseling patients about their risk for breast cancer including their breast density, the importance of breast cancer screening, and the imaging tools available for patients at risk. Postgraduate Institute for Medicine is accredited with distinction as a provider of continuing nursing education by the American Nurses Credentialing Center's Commission on Accreditation. This educational activity for 1.0 contact hour(s) is provided by the Postgraduate Institute for Medicine. From left to right: Emily F. Conant, MD, DaCarla M. Albright, MD, and moderator Nancy M. Cappello, PhD, Founder & Director, Are You Dense, Inc., and Are You Dense Advocacy, Inc.
Dr. Albright is currently Associate Professor of Clinical Obstetrics and Gynecology at the University of Pennsylvania School of Medicine. She received her medical degree from University of Michigan Medical School, followed by a residency in Obstetrics and Gynecology at Sinai Hospital of Baltimore. Dr. Albright is a member of the American Congress of Obstetricians and Gynecologists (ACOG) and the Association of Professors of Gynecology and Obstetrics (APGO). Her academic interests are strongly focused in medical education, as the current Associate Clerkship Director for the Core Clinical Ob/Gyn Clerkship at the Perelman School of Medicine and Chair of the Undergraduate Medical Education Committee. Clinically, she has a thriving practice as an academic generalist Obstetrician/Gynecologist, emphasizing wellness and prevention. Dr. Albright has lectured on breast health and screening, with a desire to inform patients and colleagues of current screening guidelines and emerging screening modalities. 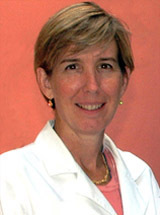 Dr. Conant is currently Division Chief, Breast Imaging and Professor of Radiology at the University of Pennsylvania. After attending medical school at the University of Pennsylvania School of Medicine, Dr. Conant went on to complete her residency in Diagnostic Radiology and then fellowship in thoracic and breast imaging at Penn. She began her career at Thomas Jefferson University Hospital and eight years later returned to Penn as Chief of Breast Imaging. Dr. Conant, a pioneer in the development of digital mammography and digital breast tomosynthesis, is a leader in research on the use and benefits of early mammography screening and on the role of multimodality breast imaging. As an internationally known clinician and researcher, Dr. Conant has received grants from the National Institutes of Health to compare standard surgical biopsy with digital mammography and stereotactic core breast biopsy. She has published more than 150 peer-reviewed articles on topics ranging from novel imaging technologies; the assessment of disparities in access to imaging; and quantitative analysis of multimodality breast images to guide personalized screening. In addition to her clinical and research responsibilities, Dr. Conant continues to guide faculty governance and organizational change at the Perelman School of Medicine at Penn. Dr. Conant is a fellow of the Society of Breast Imaging and a member of a multitude of professional organizations, including the American Roentgen Ray Society, National Association of University Radiologists, International Digital Mammography Development Group, and the Radiological Society of North America. Dr. Conant has also been recognized for her outstanding contributions to the field of breast imaging by Philadelphia Magazine, America’s Top Doctors, and Best Doctors in America. She has been a featured expert in the national media, including appearances on Good Morning America, CBS News, USA Today, The New York Times, and Redbook. Dr. Cappello, PhD is Director and Founder of Are You Dense, Inc., and Are You Dense Advocacy, Inc., with a mission to educate the public about the risks and screening challenges of dense breast tissue to prevent missed, delayed, and advanced-stage cancer, thus reducing mortality. She is the inspiration behind Connecticut’s first-in-the-nation density reporting law passed in 2009, making the state a global leader in density reporting, adjunct screening, and the density reporting grassroots movement. More than half the states have since enacted density reporting laws, and a federal bill is pending. Dr. Cappello has presented her inspiring story of patient-turned-advocate across the United States and at Scientific Forums in Rome, Tokyo, Paris, Puerto Rico, and Brisbane, Australia. Her blog, Nancy’s Chalkboard, is published by the Huffington Post and other media outlets. She is the recipient of numerous honors and awards, including being named a Health Hero by Parade Magazine, honored by the Connecticut Women’s Hall of Fame, and selected to receive the prestigious national Americanism award by UNICO. Dr. Cappello holds a BA and MS in Elementary and Special Education from Central Connecticut State University, a Sixth Year Degree in Administration and Supervision from Southern Connecticut State University, and a PhD in Education Administration from the University of Connecticut. When her mission is finished, she looks forward to rescuing a dog, learning Italian, and taking golf lessons. DaCarla M. Albright, MD, has reported no conflicts of interest related to the content of this activity. Emily F. Conant, MD, has received contracted research funding and consulting fees and from Hologic and received contracted research funding from iCAD. Nancy M. Cappello, PhD, has reported no conflicts of interest related to the content of this activity.